There are very few museums that can claim to be located in part of the actual works that they are trying to depict but The Charles Burrell Museum is one. Housed in the old paint shop of St. Nicholas Works Thetford, it is tucked away in the centre of town and is quite difficult to find. There are no signposts and the towns one way system does not make locating the building very easy at all. This visit we were lucky enough to get into the museum, as on several previous occasions we had found to our dismay that the museum was closed. It appears that only between the times of 10am and 2 pm on Tuesdays are the public admitted, a fact which only seems to be publicised on the museums leaflet which we only found at the museum! On entering the building we were pleased to discover that there was no admittance charge and so passed through the reception and shop area to the main hall. 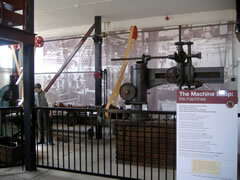 Here, in a well lit wooden building were two Burrell engines, a single crank compound traction and a compound roller, both owned by the museum and capable of being steamed. Surrounding them were various pieces of workshop machinery, an ex Dorans roller living wagon and a selection of patterns used to cast parts for engines. The display of casting a cylinder from scratch is very interesting and reveals some of the complications in making an object of this importance to the machine. 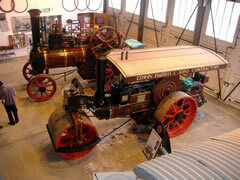 Persevere and when you finally find The Charles Burrell Museum you will take a short but enjoyable trip back in time. This entry was posted on Saturday, September 2nd, 2006 at 10:51 pm	and is filed under Museum News & Reviews. You can follow any responses to this entry through the RSS 2.0 feed. Both comments and pings are currently closed.